Come on down and check us out in the heart of Traverse City?s waterfront Clinch Park. 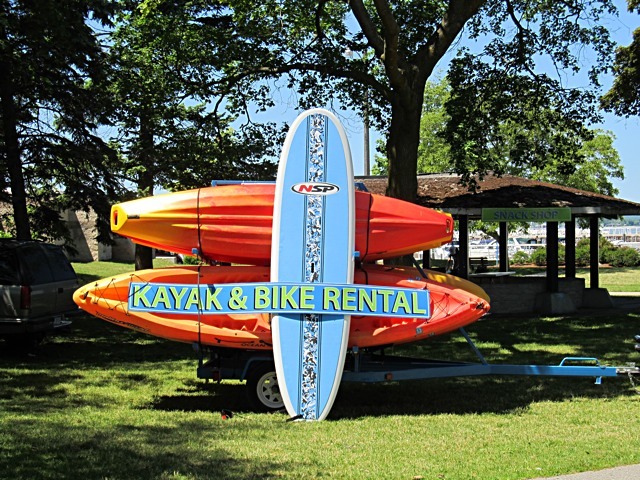 We are Traverse City?s Bike and Kayak Rental headquarters! You can also enjoy a snack and stock up on any beach going goods as you enjoy West Grand Traverse Bay and Downtown Traverse City. We are also right next to two Traverse City?s must do?s: The Open Space and Clinch Park Beach. Rent a Kayak, see the Traverse City from the Boardman or West Grand Traverse Bay like never before! The Boardman River is a fantastic River to paddle and stretches of the River are very good for beginners! The higher up the River you go, the more experience you need. Feel free to call to discuss. Bike Traverse City! Enjoy the T.A.R.T. Trail or the streets of Downtown. All rentals start from our location in the heart of Clinch Park. Cruiser Bike $20/3 hours $30 full day ($10 an hour) Fifteen Speed Hybrid $20/3 hours $30 full day ($10 an hour) Trailer/stroller $10 half day $15 full day Tag-along $10 half day $15 full day Helmets, locks and baskets will be provided at no additional charge. weekly rates available – We will deliver to your hotel! Check out the website for other recreational opportunities. When coming from Downtown Traverse City, use the tunnel that is just off of Cass at the intersection of Cass and Grand View Parkway.